You are here: Home / General Information / Animals Today July 28, 2018. Helping pets stay safe and cool in summer. Jaguar escapes zoo enclosure. A prisoner is paired with a pit bull, and both lives are transformed. The first animal shelter in the US. Animals Today July 28, 2018. Helping pets stay safe and cool in summer. Jaguar escapes zoo enclosure. A prisoner is paired with a pit bull, and both lives are transformed. The first animal shelter in the US. Are ice cubes in the water bowl a good idea? Is it legal to break a car window to free a distressed animal? How can you and your pets endure the loss of A/C from power outages? Summer brings unique challenges to people and their pets and we offer ways to survive the heat. Peter continues with Kate Dylewsky, Senior Policy Advisor with Animal Welfare Institute, to talk about the escaped Jaguar at New Orleans’ Audubon Zoo. Kate believes incidents like this occur far too often, and calls for radical transformation of the standard zoo. We continue with a heartwarming story of an injured and rehabilitated rescue pit bull who is paired with an inmate for training. The story is told by Nicole Juchem, Foundation Manager for Animal Farm Foundation and Jen Deane, Founder and President of Pit Sisters. 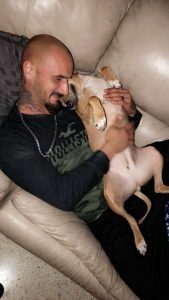 Through Deane’s TAILS (Teaching Animals & Inmates Life Skills) program, a troubled man’s life is turned around, and an injured homeless dog finds love and security.